The Hypnobirthing Australia™ program is designed by an Australian for Australian hospital practices and procedures, which are constantly changing, and therefore we are always keeping up with those changes to give couples the very best up to date information available. A recent study highlighted how important it was to not only participate in independent childbirth education classes but to also find a program that included complementary therapies to support normal labour and birth. It basically halved the intervention rates for births! 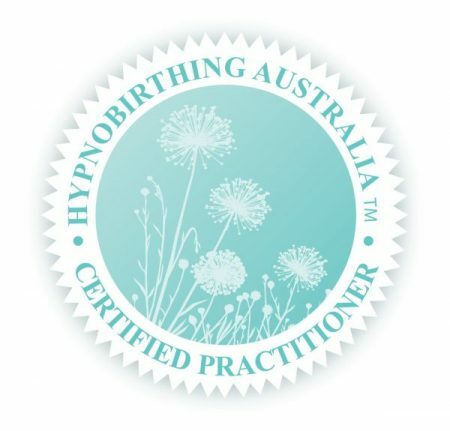 Hypnobirthing Australia™ ticks all those boxes and more – read more by clicking on the link…. The best time to start classes is between 20 and 30 weeks pregnant, to allow you time to practice, but you can do the classes at any time – they are designed to support all women at all times during the pregnancy and I continue to offer support to you to ensure that you are feeling confident and positive. We also have a resource group of midwives and other professionals that are on hand to discuss any concerns that arise, or if you require further information about something specific. This is a total of 12 hours of childbirth education, self-hypnosis techniques and relaxation techniques that will last you a life-time, not just during pregnancy and birth. These classes are different to the antenatal classes that you may attend at your hospital. They are designed to teach you about the mind and body and what is happening during those contractions (surges), what your muscles are doing, why oxygen is really important during labour (just like a marathon runner), what natural methods of pain relief you can use (in addition to information about the medical pain relief available) and preparing you for a positive birth experience – no matter how your baby is born. We talk about special circumstances and definitely don’t set you up for any unrealistic expectations – we prepare you to be prepared for anything and for any birth. We help you to feel confident about asking questions and giving your partner the confidence to support you during your labour and birth and protecting your sacred birth space. The group classes are $550 and the private classes in your own home (or my venue) are $995. Payment plans can also be arranged on request. With the private classes we can do the classes any time at your home, although I have had feedback from other participants that they have enjoyed the interaction with other pregnant couples during the group classes – it just depends on how you feel, and I am happy to work with you on either. Once you complete your classes with me you will be added to my private Facebook group to interact with other couples, receive ongoing support, coaching, information and studies that I come across, so that you can stay in touch, ask any questions or gain more confidence and support from the others. Ongoing email and phone support until your birth! Once you have completed your classes, you will be invited to join the Hypnobirthing Centre WA private Facebook group where you can share questions, ideas, concerns, challenges and achievements with all the other previous participants of my classes. Here is a birth story from one of my Hypnobirthing Australia™ couples who had an amazing hypnobirthing experience. The Hypnobirthing classes totally changed my perception around birthing! I look forward to sharing this amazing childbirth education program with you and supporting you through your pregnancy with knowledge, encouragement and information. My name is Vicki Hobbs and I am a Childbirth Educator (Back to Basics Birthing), Hypnobirthing Australia Practitioner, Certified VBAC Educator, Remedial Massage Therapist specialising in Pregnancy Massage, Birth & Postpartum Doula, Certified Placenta Encapsulator, Hypnotherapist, Aromatherapist, Reiki Practitioner and Life Coach. I am based in the northern suburbs of Perth and can be contacted by email by [email protected] or phone (08) 9303 9111.